I’ve never met a fresh berry that I didn’t like. Strawberries, raspberries, blueberries, blackberries. You name it, I’m in. Deliciously sweet on their own or jazzed up with a little hint of sugar and mint. OR… baked up into a hot, bubbly, berry cobbler… now we’re really talking berries! I have fond childhood memories of my mom’s blackberry cobbler. A cobbler that started with wild blackberries, picked in a local field. Which honestly, is a concept I can’t even imagine now as an adult. Picking wild blackberries! There’s certainly no field of wild blackberries anywhere near my suburbia home. And if there was, I would have a million questions about these so-called wild berries. Did they belong to a local farmer? Were they safe to eat? Were they actually blackberries? Nevertheless, it is a blissful childhood memory. One that I won’t let my logical, adult mind over analyze and ruin. What started with fresh picked blackberries ended in a bowl of warm cobbler, topped with vanilla ice cream or a swirl of whipped cream. Ah, the sweet taste of summer. Even though today’s recipe starts with a basket of berries from the market, it captures the same goodness as that bubbly cobbler. Fresh blackberries. A hint of orange. And a thick crumble topping. Some might call it more of a crisp or a streusel topping topping than a cobbler topping. I’ll just call it delicious. 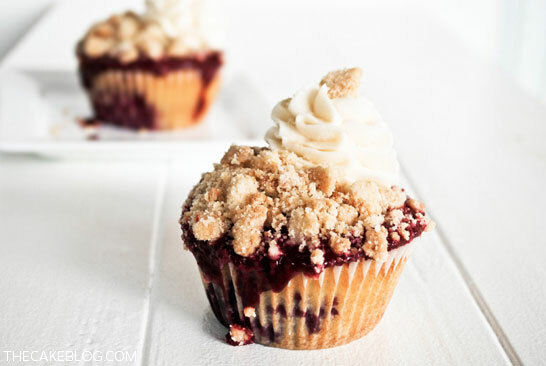 Delicious Blackberry Cobbler Cupcakes! Preheat oven to 350. Line two muffin tins with cupcake wrappers. Sift together flour, baking powder, baking soad and salt. Set aside. Gently toss blackberries with a light coating of flour. Set aside. Add vanilla and orange zest. Mix to combine. Fill cupcake liners 1/2 full with batter. Top each cupcake with 2 to 3 blackberries. Combine blackberries, sugar, orange juice and zest in a small saucepan over medium heat. Simmer, stirring occasionally, until berries start to burst. Cool slightly. Pour into blender and puree until smooth. Pour through a mesh strainer into a bowl to remove any little bits. Cover and store sauce in refrigerator until ready to use. This can be made several days in advance. Preheat oven to 350. Line a baking tray with parchment paper. In a food processor, combine flour, sugar, salt and butter. Pulse until the crumbs are fine. Spread into a thin layer on the baking tray and bake for 10 minutes. Remove pan from oven and flip, stir crumble topping with a spatula. Break up any large clumps. Bake again for an additional 10 minutes. Remove from oven and stir. Bake an additional 5 – 10 minutes until golden brown. Let cool completely. This can be made a day in advance and stored in an airtight container until ready to use. Spoon roughly 1 tablespoon of blackberry glaze onto each cupcake. Spreading it over the top with the back of your spoon. Sprinkle with cobbler crumbs to coat. Finish with a dollop of whipped cream or vanilla ice cream. I personally went for a swirl of vanilla buttercream frosting. TIP #1: This recipe involves several steps. If you’re short on time or have an impatient toddler (a-hem, I mean helpful little baking buddy) break it up and make the blackberry glaze and crumble topping a day in advance. Both keep well. Store the glaze in the refrigerator and the crumble topping in an airtight container on the counter. TIP #2: And if you need to transport these cupcakes, make sure to give them ample time to set up before hitting the road. They will become more stable as the blackberry glaze sets into the cupcake. Although skeptical, Mr. Sellman successfully made it to work with these cupcakes in tow. And that’s really saying something… with his love of lane changes. And rush hour traffic. TIP #3: Forks are highly encouraged. Those look delicious! I think I may have to try this within the next couple of weeks. Do other fruits work with this recipe? Your blog is very nice. Your making process is useful for special day for special one to make happy.Cake is very delicious for everybody.I’m waiting your next cake recipe. I’m seeing so many desserts this month made with fresh fruits. 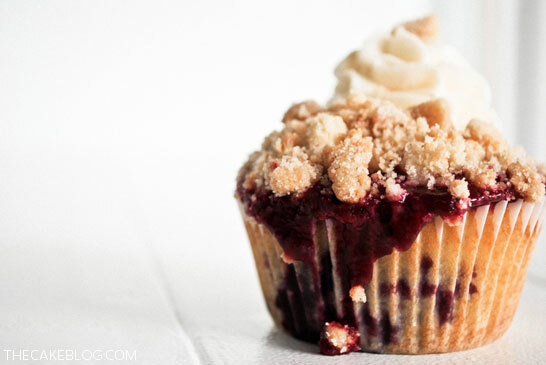 Your Blackberry Cobbler Cupcakes are absolutely gorgeous and appealing. Well done. mmm. 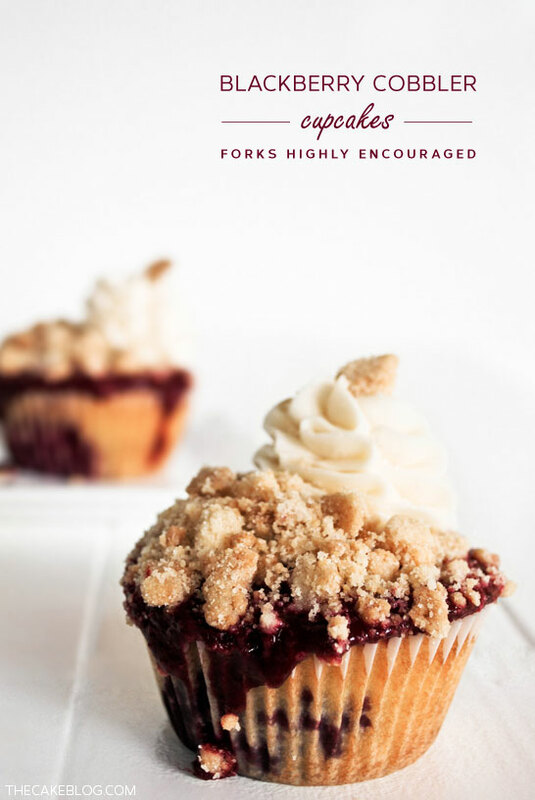 i love cobbler, but have never thought of cobbler muffins. these look so good! These cobbler cupcakes look amazing. I bet eating them brought back those childhood memories! Wow!!! These look spectacular, I am definitely trying them. Did they take you too long to make? We are doing a cupcake contest at work tomorrow. My ingredient was berries, so this is what I’m making! Wish me luck! !